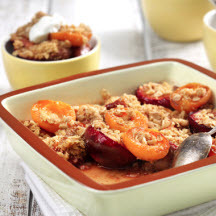 A variety of stone fruits looks great and tastes delicious, but use any fruit in season, or a combination, for this simple dessert. Recipe created by cookbook author and food columnist, Julie Van Rosendaal. In a 13x9x2-inch baking dish, arrange halved fruit cut-side up. Drizzle with canola oil and sprinkle with sugar. Place in oven and roast for 15 minutes, until starting to soften. Meanwhile, in bowl (or bowl of food processor), combine topping ingredients and pulse or blend with fork until well blended and crumbly. Sprinkle evenly over fruit or use spoon to fill hollow middle of each fruit half. Bake for additional 15 to 20 minutes, until topping is golden and fruit is tender and bubbly around edges. Serve warm with yogurt, ice cream or whipped cream. Makes 8 (1/2 cup) servings. If you like, add a handful of sliced almonds or hazelnuts to the topping mixture. To streamline the recipe, crumble gingersnaps, oatmeal cookies or amaretti overtop of the fruit instead of making the topping yourself. Nutritional Information Per Serving (1/4 of recipe; 1/2 cup): Calories 190; Total Fat 8g; Saturated Fat 0.5g; Cholesterol 0mg; Sodium 0mg; Carbohydrates 30g; Fiber 3g; Protein 2g.